At A Perfect Dat Farm, grass-fed beef is a means to an ecologically sustainable end. The doe-eyed Jerseys and shaggy-faced Red Devon-Angus cattle chewing their way through a field at A Perfect Day Farm are a postcard for grass-fed beef. But for Matt Rales, 34, they’re the centerpiece of a much grander project taking place on the 800-acre farm in Virginia’s bucolic Fauquier County. It’s an opening salvo in a complex tale about how the careful grazing of cattle can benefit biodiversity, chipping away at climate change as the cows create a landscape that can more efficiently sequester carbon and filter water. “But I can get into the weeds,” Rales says, self-consciously, halfway through a description of the diverse mammal species that once roamed North America, an ancient system he’s trying to mimic here. His fiancée, Abigail “Abby” Fuller, 32, laughs. “I try to translate,” she says. If Rales wants to relay the story that has just begun at this farm, purchased in 2016, he couldn’t have found a more fitting partner. A documentary filmmaker, Fuller is the youngest and only female director of Netflix’s Emmy-nominated series “Chef’s Table,” having produced episodes on chefs Ana Roš and Tim Raue, with more in upcoming seasons. The couple met through mutual friends and talked on the phone for four months before meeting in person. They are planning a January wedding. 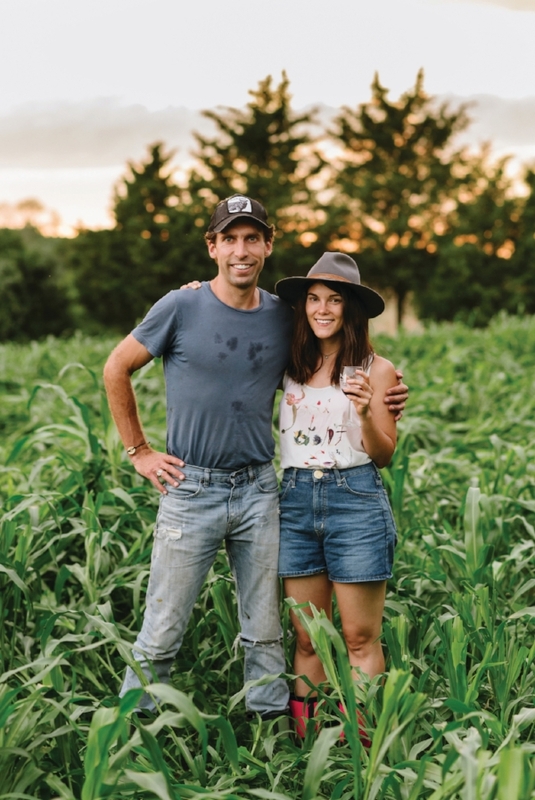 Matt Rales and Abigail Fuller, the duo behind A Perfect Day Farm. For Rales, who earned a degree in environmental science at Middlebury College in Vermont, the farm is the culmination of years of studying how to manage animals in harmony with the environment. Rales spent three years working for Virginia’s sustainable agriculture savant Joel Salatin at Polyface Farms and has also worked at farms in Zimbabwe, Botswana and California. “More than anything I spent a lot of time reading,” says Rales, whose background includes running a “suburban farm” in Potomac, MD, that served DC restaurants such as Komi and Marcel’s. Rales’ brand of farming is as thoughtful as it is labor intensive, leaving him moving cows through the pastures with the help of electric fencing as often as four times a day at the peak of grass-growing season. At any given moment, up to 99% of the farm’s acres, including another 750 acres being leased nearby, are resting. The cattle munch, fertilize and trample a tiny fraction of the total, leaving behind a matted carpet of plant matter and nutrients that improves soil health over time. The scientists who study this type of farming in the Chesapeake Bay call it management-intensive grazing, but farmers often refer to it as mob grazing, holistic grazing or rotational grazing. The practices have slowly added followers in the region, with nearly 200 farms included in a 2016 directory of grass-fed-meat producers in Maryland, Virginia, Delaware and West Virginia—a number that’s tripled since the first directory was published in 2005. For Rales, grazing cattle is a mental exercise that evolves as he learns—both from the latest research and from his own daily experiments—about the impact their presence can have on the land he’s stewarding. He began work at this farm, which had been growing hay and grass without animals for years, with a comprehensive baseline assessment of its soils. Surveys and 88 core samples measured everything from calcium to organic carbon and gives the farm a starting point to compare with future changes. This scientist-farmer approach doesn’t rely solely on beef sales to support it, at least not yet. The land is also bolstered by conservation easements that prevent development on some of its wooded acres while allowing farming to continue. Rales is also looking to monetize the work the farm is doing for the environment and dreams of them being paid for the “ecosystem services” they provide. On the West Coast, he’s seen conservation groups recognize the role of animals in reviving environments so they can support endangered species or eat away the dry vegetation that might fuel wildfires. “So far, there hasn’t been a market for it in the East, but we’re certainly interested in creating that or participating in it,” he says. A sampling of A Perfect Day Farm’s grass-fed beef. Moving here from California, Fuller says she’s found plenty of interest in and around DC in the work they’re doing. Through the group Pineapple DC, Fuller met Kelsey Weisgerber, who manages the school lunch program at Mundo Verde Public Charter School. The two worked together to turn A Perfect Day Farm’s beef into burgers for a school lunch in May. The majority of the farm’s meat is sold through Hardwick Beef, an aggregator that sells to restaurants and shops around New York City and online (hardwickbeef.com). The farm has started hosting pop-up sales inside the District to meet local demand, along with the occasional farm tour open to the public. During a late-summer visit, following heavy rains, the fields were Technicolor green, dotted with black-eyed Susans and Queen Anne’s lace. I asked Fuller how well she was resisting the urge to use this as the setting for a film on the promise of regenerative agriculture, and she grinned. To find out about a dinner featuring the farm's products in September and a pop-up sale in October, sign up for its newsletter at APDfarm.com or follow the farm on Instagram @apdfarm.